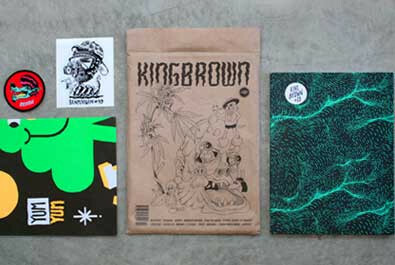 "Kingbrown magazine is simply awesome! The cover and contents are amazing before you even open the magazine. A sticker, a patch, a poster along with a hand sewn paper bag and a embossed cover by Brendan Monroe. The photos and contents are classic Kingbrown. Filled to the brim with great studio shots and work from the finest contemporaries in the game today. Clean and to the point interviews that inform the reader instead of boring them." Co-curated by Black Canyon Projects (Sean Morris and Tom Groves), this issue has well been worth the wait. Featuring brown bag artwork by Future Colors of America, all-over embossed cover by Brendan Monroe, and three extra inserts including a fold-out neon poster by Malarko, die-cut vinyl sticker from Sheryo and a glow in the dark patch by Stevie Gee. Interviews include Neck Face, Skinner, Saner, Brendan Monroe, Cone the Weird, Sheryo, Stevie Gee, Hellen Jo, Michael C. Hsiung, Lugosis, Malarko and more. 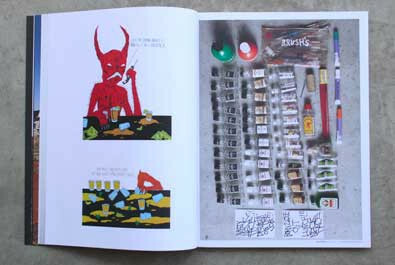 112 full colour pages, plus inserts. Printed and finished with attention to detail. Sewn sealed in a brown bag for quality freshness. Finished size: 216 x 285mm. Perfect bound, made to last.